- Stolen, an adventure/crime story written by myself and artist Cormac Hughes, is coming along nicely, with more excellent artwork pouring in as I type. There will be a few extra previews to show you soon, but there are a lot of exciting things happening behind the scenes which will be revealed as well in due time. "They are murderers, martyrs and mercenaries in the no-man’s-land between adventure and crusade – soldiers of fate and fierce honour, bound together in mystery, darkness and blood. Their enemies are shadows haunting the outermost borders of a darkening world, and as night approaches the shadows grow long. 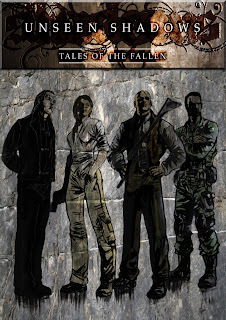 "They are the Fallen, and these are their stories." Tales of the Fallen will launch on 19 November 2011 at Thought Bubble in Leeds. You can read some previews at the official Facebook page. "Learn how the self-published cult hit novel Fallen Heroes became the epicentre of one of the biggest transmedia experiments in the UK indie arts world comprising comics, prose, audio, live action and including trailblazing talent from all creative fields."